U.S. Sen. Susan Collins, who cast a deciding vote in favor of confirming Brett Kavanaugh to the U.S. Supreme Court, said Monday that she is feeling “vindication” after the new justice’s vote on a case involving funding for Planned Parenthood. “I certainly do” feel vindicated Collins told reporters gathered on Capitol Hill, according to CNN. The Supreme Court on Monday declined to hear an appeal backed by 13 conservative states that sought to defund Planned Parenthood, according to the Los Angeles Times. That effectively leaves in place federal court rulings that prohibit states from denying Medicaid funds for women who visit Planned Parenthood clinics for health care needs, such as cancer screenings. Kavanaugh and Chief Justice John Roberts joined the court’s liberal wing in denying the case a hearing. Justices Clarence Thomas, Samuel Alito and Neil Gorsuch dissented. Collins voted to confirm Gorsuch to the court in April 2017. Earlier this year, Collins, who says she supports abortion rights, was under intense pressure from progressive and abortion rights groups to reject the confirmation of Kavanaugh, who was nominated in August by President Donald Trump to replace Justice Anthony Kennedy after he announced his retirement in July. Kavanaugh’s nomination was cheered by abortion foes, while abortion rights supporters warned that he could undermine Roe v. Wade, the landmark 1973 ruling legalizing abortion nationwide. His confirmation was nearly derailed after California professor Christine Blasey Ford alleged that Kavanaugh sexually assaulted her while both of them were in high school in the 1980s. Kavanaugh denied those allegations, and Collins has said she believes his denials but also believes Ford was assaulted. 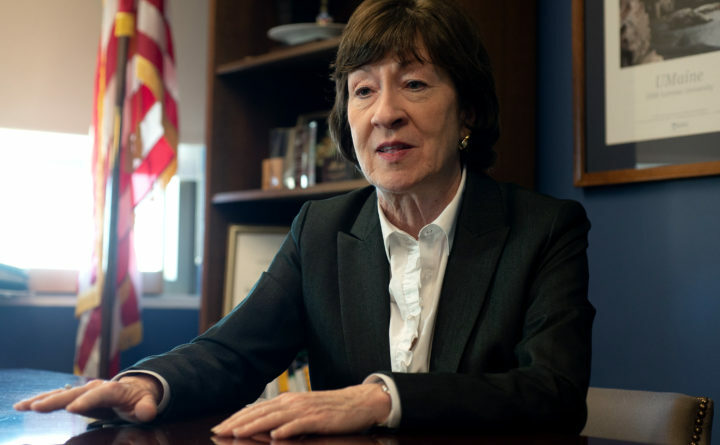 In a 45-minute speech delivered on the Senate floor in October, Collins announced that she would vote to confirm Kavanaugh to the high court, praising Kavanaugh’s deference to judicial precedent and describing the nomination process as more like a “caricature of a gutter-level political campaign than a solemn occasion.” She voted to confirm him the next day. Progressives opposed to Kavanaugh’s nomination told CNN that Collins’ confidence in Kavanaugh is misplaced after Monday’s decision. “Sen. Collins is wrong to think that Kavanaugh’s vote on Monday signals any support whatsoever for Roe v. Wade,” Elizabeth Wydra, president of the Constitutional Accountability Center, told the TV network.